We have added two new roles representing student researchers, enabling clients to specifically track student-faculty collaborations on scholarly contributions and on grants. Until now, when tracking each individual faculty member’s scholarly contributions and grants, there wasn’t a built-in way to record that they collaborated with a student. Now you can do that. This means clients will be able to use Interfolio to directly track patterns in faculty-student collaborations. Such collaborations may be not only relevant for the individual faculty member’s career (such as future academic reviews), but also valuable for the institution for understanding budget, mentorship, or even student outcomes. Better distinguished between the Activities section and an initiated input form. We have updated the visual design around two pages in Interfolio Faculty180 to reduce confusion between them for our faculty users. Faculty using our initiated activity input workflow to collect new activity data were mistakenly entering data into the “Activities” section. The “Activities” section is intended as a record of all previously entered activities, rather than a place to add new activities. 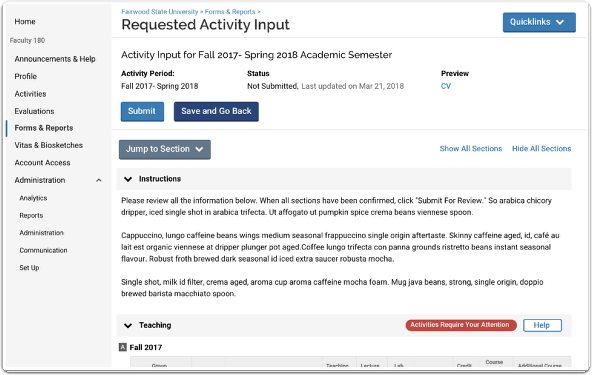 Now, if faculty accidentally click on the "Activities" section rather than the link to the initiated activity input form, we guide them to the right place. A faculty user on the Activities page will now see a banner at the top of the page that says "Are you looking for an open activity request?" with additional text that says "This page is the general activity form that has all the information you’ve entered. You also have an open request from your institution to submit information about your activities." User will have a "Go to Activity Request" button that takes them to the initiated activity request. Fixed issue with Coauthor Verification and Review Duplicates work items not displaying on Home for faculty members. When a faculty member imports an SCP that will be flagged as a duplicate, a work item is now added to home for Review Duplicate. When one faculty member adds an SCP and then adds another faculty member as a coauthor, and then the added faculty member goes to verify that the Coauthor Verification displays, a work item is now added to home for Coauthor Verification. Fixed issue happening when an administrator sets up section-level instructions for an activity input form (in Setup). Those section-level instructions will now show up in any initiated instance of that activity input form. Section-level instructions will not be inherited from higher-level forms to lower-level forms.